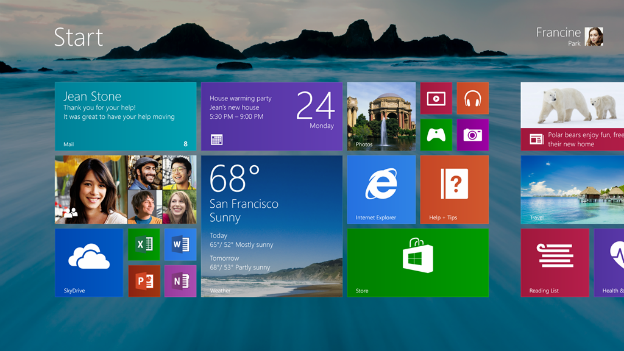 Microsoft has confirmed the price of Windows 8.1 for non-Windows 8 owners. Upgrading to Windows 8.1 will cost users of older versions of Windows $119.99, while the Pro version of the operating system will cost $199.99. The prices are the same as Windows 8. The update will be available as a free download for existing Windows 8 users. Microsoft noted in its blog post that prices will vary by market. It has not yet announced UK pricing. At current market rates, those prices are around £75 and £125. The US prices do not account for sales tax (VAT). The company also gave some more details about the upgrade process. Windows 8 users will simply need to update their OS. However, things become a little more complicated for users of older version of Windows. Those using Windows 7 will be able to pack their files and transfer them across. However, all programs will need to be reinstalled, including Microsoft's own Office software. Users on Windows Vista and XP will need to do a full install. Microsoft urged those upgrading from Vista and XP to boot from the DVD. It said that those on Windows 7 should be able to upgrade via download without issue.